We’re taking a look at the top Spanish songs of 2018 here to kick off the New Year. If you missed it, go back and check out Part One for five of the most popular songs en español from last year. Get your notepad out, put your dancing shoes on, and let’s listen to another handful of super popular Spanish songs from 2018. ¡Vamos a bailar, amigos! 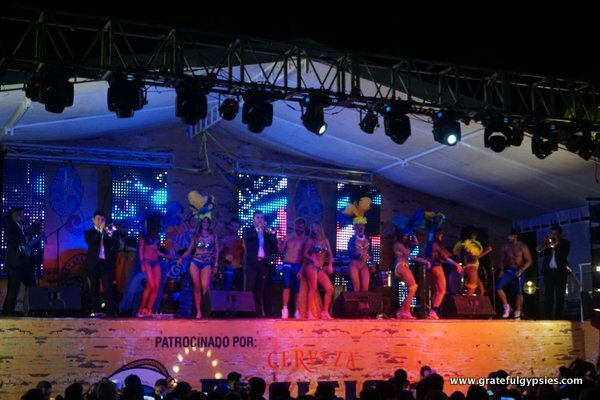 A live band jamming out at Carnaval in Mazatlan. Once again, I’ve included the original music video, the Spanish lyrics, a karaoke-style video showing the lyrics, and then a translation into English. This way you can watch the music video first and just enjoy it, then study the lyrics afterwards. When you’re ready, try to sing along. It’s a really fun way to practice Spanish, even if you’re tone deaf! Hah, welcome to the crypt! Give me your little thing, ah, ay! And the DJ plays with the stories of the midrib? And I don’t find your face despite my efforts. the house and the silence speaks to me about you. me today just to have you, so that you’d return. I refuse to lose you, to never see you again. I refuse to accept that our relationship is over. I refuse to accept that it’s over, that our relationship is over. nothing is the same without you. To what you did to me, so I can’t forget you. You love me in your way. My mind wished to find myself. that it would give anything for you to return. You say how to forget you. And in your eyes I see that you lie. Now I can say: love, suffer the way it feels. I’ll get you out of my mind and it will be sudden. The loneliness is killing me. It hurts to know that you’re not here. And that you’ll answer when I call, that you’ll come back in the night. We can still give it a chance, don’t pull away from my life. I am still here, confused and lonely. Crying at night, dying by the day. Living through this agony, I can’t understand that you’re no longer mine. The circle closes and the pain buries me. It’s so hard to live in this war. I refuse, although you say I’m blind. Ever since you left I’m a rover. I arrive late to every commitment. I’m distracted, can’t stop looking at your photo. If you’re my life, why do you liquidate me? I didn’t cause your departure. I need your scent. I need your heat. I need to see you on top of me in your underwear. house and the silence speaks to me about you. Puro coqueteo ¿y pues yo que hacía? ¿Qué te hace daño, si no fue en tu año? There was flirting, and what did I do? What hurts you if it was not in your year? I wait for your call, come score a goal on me! I’m sure you noticed a common theme in these popular Spanish songs. They’re all “love” songs of some sort (with some a bit more risque than others, obviously), which seems to be true of a vast majority of popular songs in Latin America. I always find it enjoyable to read the lyrics as a fun Spanish lesson. Were there any Spanish songs from last year that you particularly enjoyed? Leave a comment and let us know! I’m always looking for new music!